Invisible braces from $1650 – are you ready? 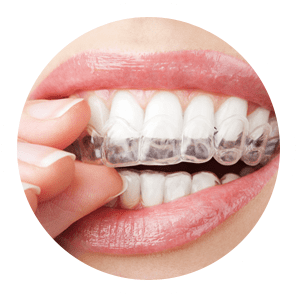 Invisible braces are an alternative to traditional metal dental braces; a series of clear, removable teeth aligners. Most orthodontists and dentists recommend this type of treatment these days. We find that patients are more comfortable with the idea of invisible braces and they aren’t as tricky to wear as the traditional ‘metal mouth’ because they’re removable. This means you have the convenience of being able to take them off during meals or when you’re brushing your teeth. Every two weeks you change to a next set of aligners – individually manufactured for your teeth only. (Normally, though, you only visit us once every six weeks.) Your teeth move, week by week, every time you replace each aligner until they arrive at the desired position. Your treatment can take from six to twelve months. We partner with orthodontists and other dental surgeons to offer low-cost Clear Correct invisible braces . Clear Correct braces are a high-quality American version of other international brands. However, they cost a whole lot less while still offering the same good results. Overall, we believe they’re much better value for money. What do Clear Correct invisible braces cost? We have Invisible Braces aligners for $1650 including both arches and The maximum cost of these invisible braces is $4,850. The final cost will be based on your specific needs. If you don’t have much to fix, it won’t cost as much. Simple. Can I claim Clear Correct invisible braces on my health plan? Some funds cover teeth-straightening treatment; it depends on your plan and level of cover. Check with your health fund or check your plan. Want to get started with Truline invisible braces?